He was a member of the "Big Red Machine" and perhaps the finest catcher of his era - Johnny Bench was an institution behind the plate for the Reds from 1967 to 1983, and subsequently inducted into the National Baseball Hall of Fame in 1989 on the first ballot. This is a great looking Cincinnati Reds franchise tribute Cooperstown model bat featuring the autograph of Johnny Bench. Every Reds fan and collector of Hall of Fame player autographs will want this fine piece of memorabilia for their own. Get it now before it is gone. Authenticity by PSA/DNA included. Due to the singular nature of this offer we must charge your credit card for the full price immediately upon taking your order. This policy ensures we reserve the bat for you. We will confirm your order by Email. This bat is not game used. Please allow at least 2 weeks for delivery. 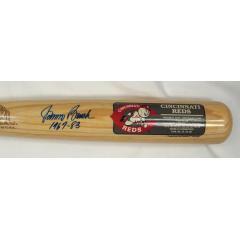 Johnny Bench Autographed Bat $595.00 Sold Out!